I have been testing the Gentleman of Leisure Beard Oil, its an unscented oil and is their only Beard oil. 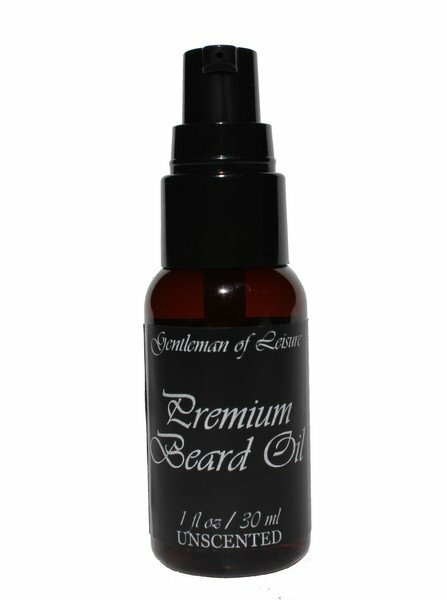 Gentleman of Leisure is a one man operation in Langley which is in British Columbia, Canada and prides itself on the quality of the oils used in this beard oil, so much so that he believes that the oil is so good that it should be unscented. A 30 ml bottle with a pump applicator contains an oil that is a very good blend of Grapeseed, Jojoba, Sweet Almond, Fractionated Coconut, Avocado, Camellia Seed, Castor and Vitamin E carrier oils. I have to admit that this is a very good beard oil, the carrier oils have been blended perfectly and gave my beard a decent amount of hold for an oil, it left my beard looking and feeling good and didn’t make my beard look greasy. This oil will help stop that dreaded beard itch and beardruff and even my wire wool beard felt good after using this oil. This has been my favourite unscented Beard Oil, its ingredients have been carefully chosen for their various benefits. The journey that has led to me creating and selling beard oil is made up of three equal parts. #1 How hard it is to find decent beard oil in a brick and mortar store. It’s no wonder why so many beards are neglected. You can’t go into a big box store and find beard oil sitting next to the Head and Shoulders shampoo, it’s even rare to see it at any barber shop. One of my many goals is to get Gentleman of Leisure products on shelves. #2 My love of nicely maintained facial hair. Having a beard, feeling a beard on your face, tasting residual rib sauce days after eating ribs, stroking a beard while others look on in admiration, jealousy, or curiosity as to what this hairy man may currently be plotting are just some of the perks that come with growing out that beautiful mane. However just growing your beard out without giving any attention to care will give you a whole bunch of other undesirable side effects such as but not limited to: dry itchy skin, split ends, and only attracting women with more flannel shirts in their closet than pairs of shoes. Giving men a quality beard oil is the first step to preventing the takeover of the scruffy unkempt man. #3 The many members of the general public who think having a beard of any length is unprofessional, thinking a bearded man is lazy and that beards are dirty. I find that trying to change peoples perception of things once they have formed an opinion is often pointless, and really who cares, I am not covering my face with hair for their benefit. Where this comes into play is in regards to careers. I interviewed for a job where things were going fine until the interviewer casually mentioned that I’d need to shave before I start work. When I realized she wasn’t joking half way through her “we have a certain professional image we need to maintain as a company” speech my mind wasn’t thinking about trimming, cutting, or shaving. As I sat there listening to this overweight woman in a poorly fitted pants suit all I could think about was how offensive and unfair this was and how I could start my own company to crush theirs… I quickly realized that was just the anger talking as it would require a lot of resources I didn’t have to take down one of Canada’s big six banks. I believe that I am meant to have a beard, I believe that my beard is a part of me and my personality, and I know I am not alone in my thinking when I say if I were to be clean shaven I would lose a part of me and who I want to be. That interview experience encouraged me to stay self employed, and now I have this new endeavor to keep me busy.